Families, jumpstart your Sunday with a special worship service geared for your young children. 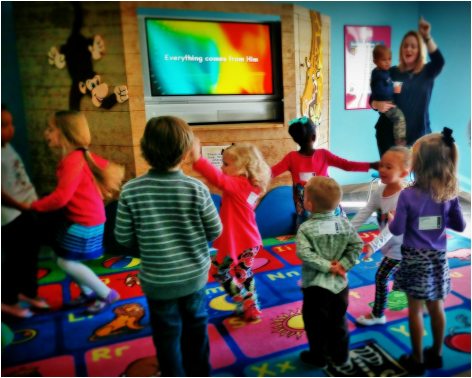 Our kids' worship services, offered during both regular adult worship services, give children a great way to learn about God’s Word, while also making new friends. Using the Gospel Project for Kids worship program, we amp up the fun with age-appropriate Christian music and a Bible story puppet theater that introduce the Message to children on their level. Our small-group Sunday School hour helps children engage with the Word in a more personal and meaningful way each Sunday. As part of our family-based ministry at Crosspoint, the Gospel Project for Kids curriculum provides fun and developmentally-appropriate activities for your child to connect with the same message you receive in your adult Sunday small-group class. Look for the collectable take-home message cards each week, so you can review the lesson with your child. For more info on this curriculum, see www.gospelproject.com/kids. Our colorful and inviting nursery space offers a fun and loving experience for your little one, while you enjoy your worship service and small group class knowing your child is receiving the best care. During their stay, babies and toddlers alike will be engaged in the Message of the day with age-appropriate activities from The Gospel Project, so they can begin to know Jesus’ love. In addition, our Parents Room, located beside the Nursery, is available for nursing mothers or parents who just need a quiet space for their little one, while they view the live worship service. Love. Equip. Act. Praise ... L. E. A. P.! Join us for an exciting worship service to connect with friends in fun Christian fellowship, music, games, and learning. We use curriculum that is whole group, media-based, Gospel-centered, and is a interactive program that shows children how to apply the Gospel to their lives in service to others through a large group message, dramatic skits, small group discussions and crafts, and interactive songs and games. This program is designed to help children begin to understand what it means to be a Christian and how they can personally love God, love others, and serve as part of God’s family. Come early; a light supper is offered at 5:15pm. See what happens each week in KIDZpoint by joining our exclusive Facebook group!